Rice, is such a staple in Louisiana. If you haven’t been to the International Rice Festival in Crowley, Louisiana. Plan a visit one year (3rd weekend in October), you will have a new respect for rice! Rice-No matter how I try to figure the correct amount needed, I always end up having leftovers. But at least, leftover rice is a good thing. In fact, you can’t make good fried rice without having some. Have leftover risotto? You have the makings of Arancini. Yep, those Italian delicacies are made from leftovers!! The holiday season is upon us, that usually means holiday parties. Either entertaining or going to be entertained, holiday parties mean appetizers or if you prefer to sound fancy, hors d’oeuvres! I suggest when planning your social engagements, plan what you are going to bring or to make at the same time. This will save you stress, time and money! Without proper planning, you can fall victim to forgetting until the last-minute, running in a store, buying a “tray” of something (usually way over priced) and either making it appear homemade or apologizing for the store-bought tray! Think ahead and let’s start saving. To get the savings started, if you don’t already have one, invest in a mini muffin tin. 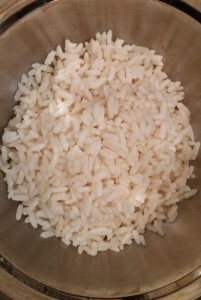 Rice Rounds: So you made some gumbo and like me, you have a bunch of rice leftover and you have some friends coming over for a cocktail party. Don’t stress. Let’s cook to impress! This would also be great with any leftover jambalaya or broccoli rice casserole! 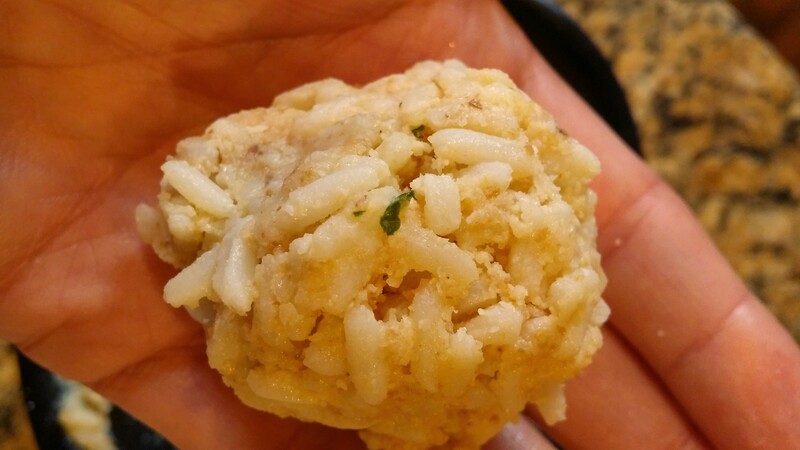 This is a basic recipe to get the “ball of rice rolling”. Start with 1 cup of cold leftover rice. Any kind of rice works, even flavored kinds.Today I am using extra long grain. Add in one egg or substitute 1 TBSP of mayo. 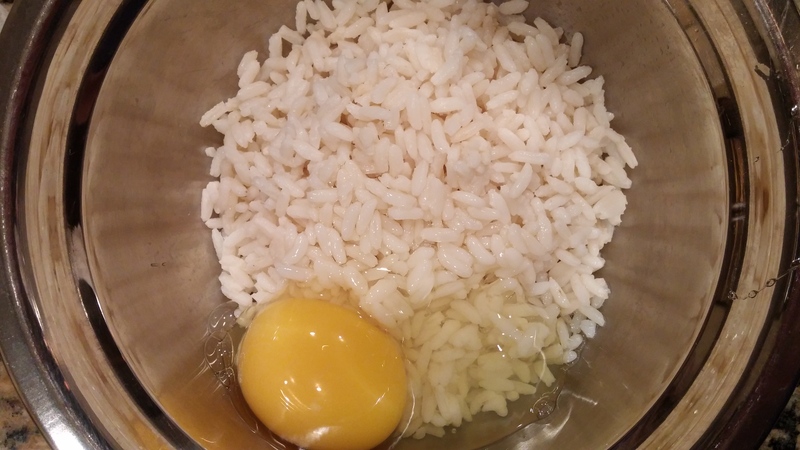 The egg or mayonnaise is going to help our rice rounds stick together. 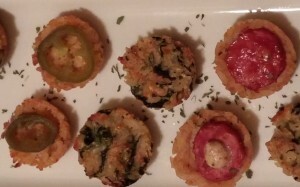 Here is where you can get creative and really personalize these appetizers. After mixing in the egg or mayo, I like to divide my mixture into two bowls so I can make two different flavor batches, but this is up to you. Season the mixture with complimentary seasonings. I’ll help you out. 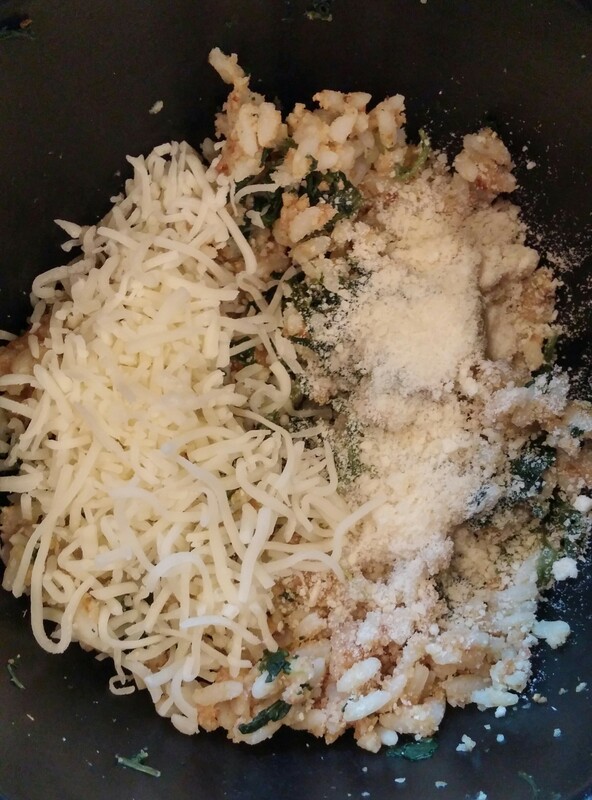 One of my favorites is adding steamed spinach, garlic powder, Parmesan cheese, and some grated Mozzarella cheese. You want to add in ingredients until your rice mixture, when squeezed, stays together. This is a picture of my mayo batch. See how it stays in a ball shape. To this mixture, I added bread crumbs instead of Parmesan cheese, hot sauce, onion powder, and some Cajun seasoning. Once you have you rice mixed and ready. Take 1 TBSP at a time, form into balls and press into your nonstick mini muffin tins. You could use 1/2 TBSP for thinner rounds. 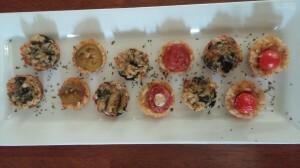 You can then bake as is or get creative and use what you have on hand as a filling. I have added some cooked sausage and some Pepper Jack cheese to my mayo mixture. 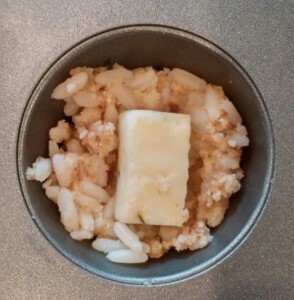 Put into center of rice and press down. Then take a 1 TSP of mixture and press on top. I like to stuff some, top some, and leave some plain. 1 cup of rice yields about 18 rounds. All bake for 20 minutes or until brown. 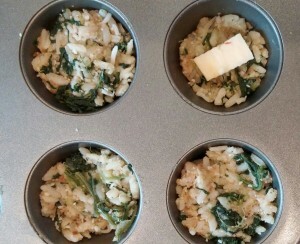 Here is what the yummy fillings look like: spinach and cheese; sausage; and cheese. You can also just top the rice rounds before baking. 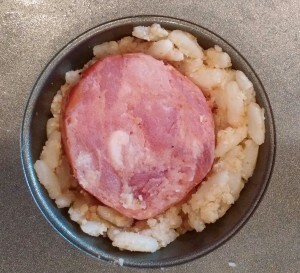 Here is one ready for the oven with sliced smoked sausage, great for football gatherings. (A much fancier option than some sausage on toothpicks!) 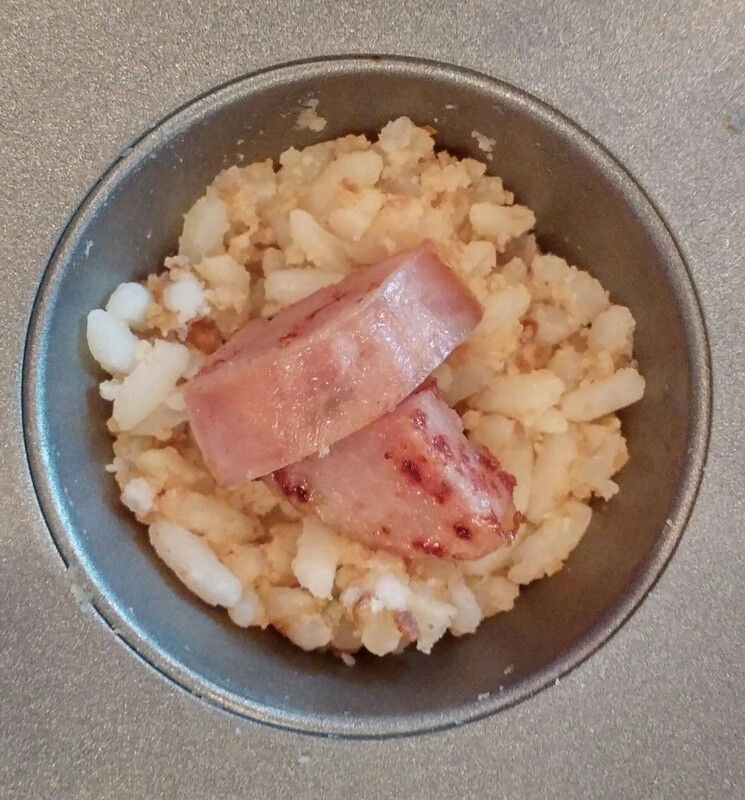 You could also grind the sausage and add it to rice mixture-think boudin balls! To serve, it is all about presentation. I like to arrange a few different kinds on a platter. If you used sausage, top with spicy mustard or barbecue sauce. Have sliced jalapenos, spice it up even more! Put your TO COOK IS TO CREATE thinking cap on: This is really a quick simple idea to use what you have on hand. Everything goes with rice-at least here in Louisiana! Have some leftover beans, bake rice rounds, then dollop some heated beans on top. I like to serve some black-eye peas like this for a New Year’s Day party! Easy hand-held snacks. What other seasonings, fillings or toppings would be good? 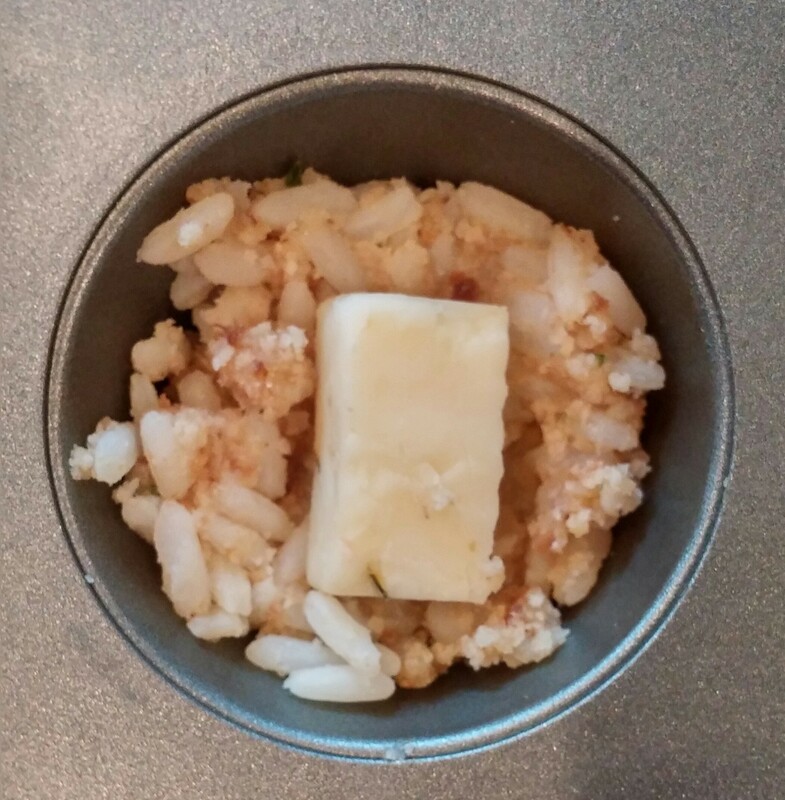 For example, taco seasoning in the rice, filled with cheddar cheese, and topped with some salsa after baking. What do you like to eat with your rice? For “mock” sushi, I like to bake plain rice rounds then top with a boiled shrimp and cocktail sauce. (Usually I will plan ahead and boil the rice with some crab boil!) Like Italian? 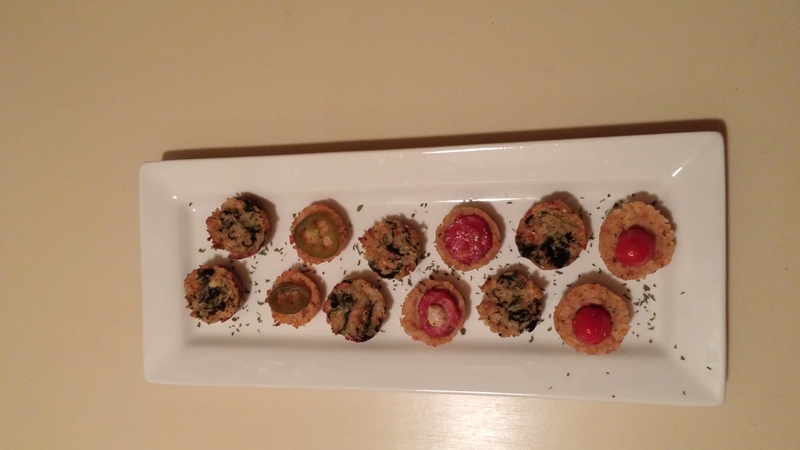 Press cheese stuffed cherry tomato into rice round, bake, top with dollop of pesto! The possibilities are as endless as kinds of rice! FOOD FUN: Explore the world. There are an estimated 40,000 different of varieties of rice in the world! Pick a rice, research its’ origins and history (fun learning project) and cook a dinner using one! Want to have your house smelling delightful, take a trip to Thailand with some Jasmine rice! What a creative idea. 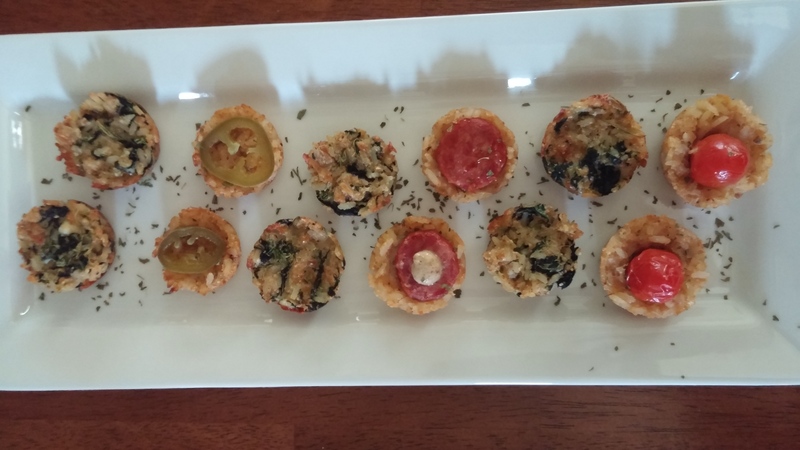 Instead of throwing leftover rice out….you have created some very appetizing treats! Endless, ideas! Never knew rice had so may options.